One of the main problems is unhealthy competition among these players with untrained and unskilled drivers and conductors engaged in a dogfight to make the maximum amount of money, causing road accidents even running over pedestrians. These buses are one of the main causes for road indiscipline in the country. Following several failed discussions, dissention and disagreement, government and the bus operators have finally agreed to revise the bus fares with a 6 percent increase from August 1. Revision of bus fares has long been a contentious issue because it directly affects the ordinary man’s cost of living while the services provided by the bus operators also have been of poor quality. The reasons for the poor quality are many. On one hand the current fare structure is nonrealistic and does not provide room for having comfortable buses on the road while on the other hand the nature of the current private bus service with individually owned buses with no proper regulatory mechanism, also does not provide a proper platform for a quality service. Drivers and conductors do not have a proper salary structure, permanency of employment or uniforms and they lack any proper training and as a result often they are not polite when dealing with the commuters. As tickets are often not issued daily collection is not accounted properly. Such accounting is not important for the bus owners as they need to be paid a stipulated amount at the end of the day and the driver and the conductor are allowed to share the balance. Indirectly this practice encourages the bus crew to make the maximum collection for the day so that they can share a bigger balance. In the process speeding and careless driving become inevitable causing inconvenience both to commuters and other road users and excessive ware and tare to the vehicles which finally affect the viability of the whole industry and the end result is the poor quality buses. The individually owned buses in the transport network have a long history. 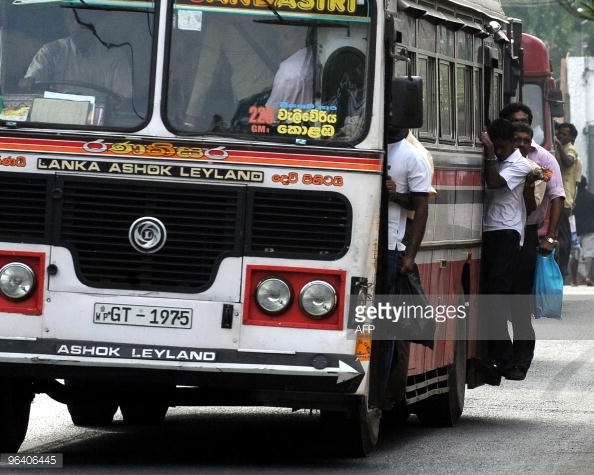 They were introduced by the J R Jayewardene government that came into power in 1977 as a patchwork remedy for the acute transport issue at the time as the CTB did not have the capacity to meet the increasing demand. Subsequent governments failed to resolve this issue because of the political sensitivities it involved and the bad security situation that prevailed in the country. However, now the time has come to look at this rationally and formulate a system to have a decent omnibus transport system in the country. This could be done either by doing away with individually owned buses and forming large bus companies with an allocated area for each of them to operate or by finding a way to run a strictly regulated and disciplined bus service with the existing individually owned buses. Either way it is going to be a difficult task which has to be accomplished within a reasonable time if we are to move forward as a country.